One task I like to include on my spring cleaning list is reevaluation of the entire home. Sometimes a space needs to be rearranged in order to expel bad living habits. Basically find out what's cramping your style, yo. 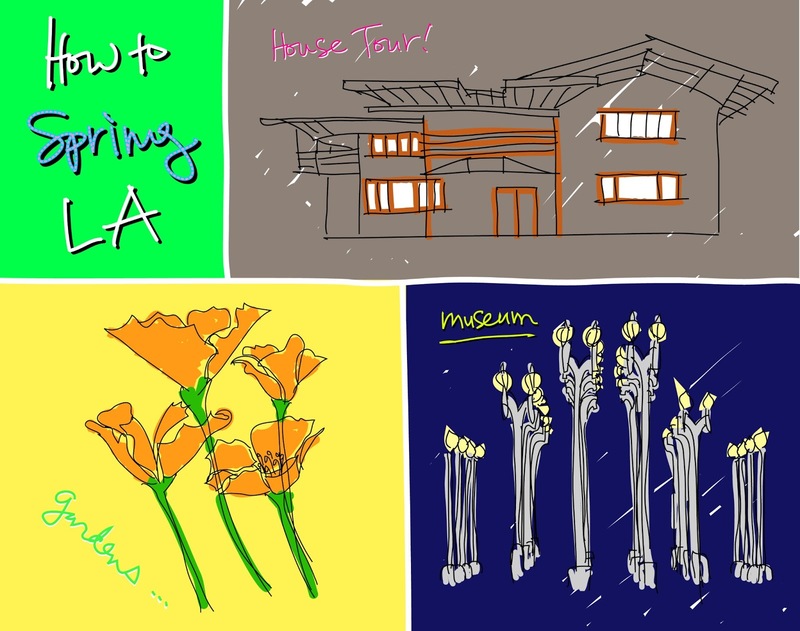 A good way to start is to visit some iconic LA homes for ideas, especially when gardens are resplendent. I've toured the Neutra VLD House and Hollyhock House, but still want to check out the Gamble House and Kings Road House. Long easy days get me in the picnic and stroll kind of mood. I say this half jokingly but the only reason one would ever visit Lancaster is to see poppy flowers in full bloom (Antony agrees and he grew up there). There are dirt roads that lead you to infinite fields of orange zest. It's quite a sight and justifies intense frolicking. Other floral backdrops for your picnic, stroll, or frolic include the Huntington Library, Arboretum, and Descanso Gardens. LA museums have some great shows lined up for the spring. LACMA has a James Turrell retrospective and Peter Zumthor exhibition come May and June respectively. MOCA will present a look at A New Sculpturalism and the Getty will survey how LA constructs the future in Overdrive. Most of these shows are a part of Pacific Standard Time. If spring is about growth and moving forward, then the greatest leap is that of the mind, yo. 1. 42 is going to be a great movie. 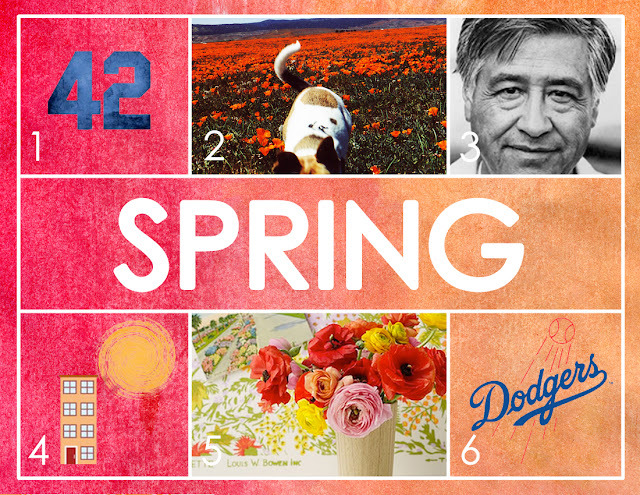 Jackie Robinson is an American hero, and a Dodger to boot! I am also looking forward to just going to the CGV movie theater and trying the new sour cream and onion popcorn. Oink! 2. Hiking in the spring is so pleasant. You see the greens and blooms peeking through the branches. No harsh heat of the summer, and no frozen noses as in the winter. Some dog-friendly hikes I'm looking forward to: a, b, and c.
3. Thank you Cesar Chavez, for your many contributions! And I'll be honest here, I'm selfishly thankful that you give me a day off work! 4. What I most appreciate about spring is the extra daylight. It really feels like spring when I have those extra minutes of sunlight when I'm coming back from work, walking the dogs, or any number of mundane tasks. I am looking forward to using that extra hour of daylight for productivity around the house. My two main projects this spring will be to a) replant my dying/dead patio garden with rosemary and other hardy plants, and b) reupholster my living room chairs. I plan to check out the following LA area resources for my home projects: Mickey Hargitay Plants, Rolling Greens Nursery, and Home Fabrics Outlet. 5. This spring, I'm dedicating some time to continuing education. I signed up for 2 classes: Pretty Paper Products and Floral Arranging 101. Floral Arranging will be perfectly fitting for the season and I'm sure the skills I learn will be helpful year round. I'm very excited about both classes as they are both in areas in which I wanted to improve my skills. 6. And of course, I am most looking forward to baseball season! Sweet springtime ushers in a new season of hope and heartbreak! Nothing like a delicious Cool-A-Coo at Dodger Stadium to help you truly enjoy the good life. Go Dodgers!! !